Following on from an earlier post I decided that the speech bubble in that post would look more like a … bubble if the corners were rounded. 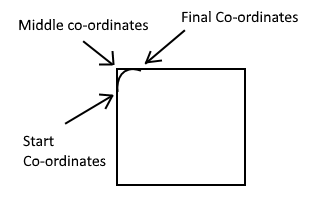 The relevant geometry to achieve this is a Cubic Bezier Curve. The MSDN page is here. The idea is that instead of drawing the line right to the corner, I go to within 10 pixels and curve round the corner. 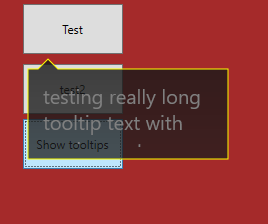 This entry was posted in WPF, XAML and tagged Path, PathGeometry, Rounded, Rounded Corners, Speech Bubble, Tooltip, wpf, XAML on April 8, 2016 by pcmichaels. 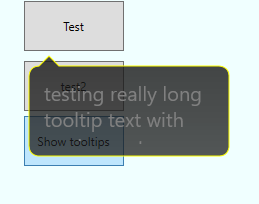 I recently tried to introduce a concept of a tooltip that appeared as a speech bubble; that is, a box that has a pointer to the originating control. (1) had the advantage that it looked much better, but doesn’t have a concept of an arrow to the source control. (2) was by far the easiest, but the arrow style makes it look a bit like a cartoon. Data="M 50,10 L60,0 L70,10 L100,10 L100,100 L0,100 L0,10 L50,10"
Data="M 50,10 L60,0 L70,10 L200,10 L200,100 L0,100 L0,10 L50,10"
The idea was to bind the line segments. I’m not saying it’s not possible; it clearly is, but it started to get prohibitively complex. If anyone comes up with a simple way of doing this (or even a complex one) then please add a link in the comments. This entry was posted in WPF, XAML and tagged Binding, Path, PathGeometry, Popup, TextBlock, Tooltip, wpf, XAML on April 1, 2016 by pcmichaels.